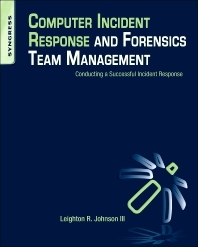 Computer Incident Response and Forensics Team Management provides security professionals with a complete handbook of computer incident response from the perspective of forensics team management. This unique approach teaches readers the concepts and principles they need to conduct a successful incident response investigation, ensuring that proven policies and procedures are established and followed by all team members. Leighton R. Johnson III describes the processes within an incident response event and shows the crucial importance of skillful forensics team management, including when and where the transition to forensics investigation should occur during an incident response event. The book also provides discussions of key incident response components. Information security professionals and consultants of all levels, incident responders, security managers, digital forensics analysts, digital forensics investigators, law enforcement officers, private investigators, government security officers. Criminal Justice students, Computer Security students, and Forensics students. Hardware Specific Acquisition—SIM Cards, Cell Phone, USB Storage, etc.